application processing to be moved and expanded in minutes. However, some data center technologies have become barriers to flexibility and responsiveness. Networking and security devices must be configured individually. Processes to modify configurations and add new devices are slow and laborious. Highly skilled experts are needed to make even small changes. 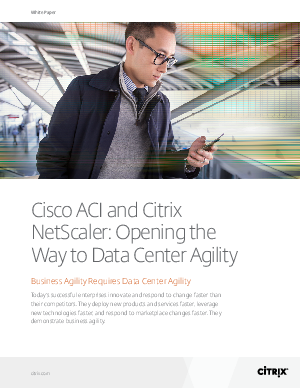 In fact, in most enterprises today data center agility, or more accurately the lack of it, is a major drag on business agility. Applications themselves have become far more flexible, but many of the promised business advantages cannot be realized while the infrastructure is rigid. Fortunately, leading-edge technology companies are developing products, methods and standards that support flexible, application-centric infrastructures.